The base model 2014 Nissan Versa Note hatchback may be the best car in America with a price tag under 14K. What does the next-generation Versa Note offer? Americans have voted with their wallets and the argument is over for which car is the best entry-level vehicle. The next-generation 2014 Nissan Versa Note combined with Versa Sedan, has held the entry segment sales leadership for 20 consecutive months and 38 of the last 44 months here in the U.S. That’s a pretty impressive feat when you consider all the competition in the segment. That lineup would include the Ford Fiesta, Chevrolet Spark, Hyundai Accent, Mazda Mazda2, Kia Rio and Chevrolet Sonic. What does the new 2014 model have to offer that will keep it number one? The 2014 Nissan Versa Note hatchback is the fourth all-new product to appear in Nissan showrooms in recent months. Nissan plans to stay at the top by giving the compact new exterior styling, interior versatility and advanced technology that will appeal to the new generation of buyers. This is a critical global market segment and Nissan knows they have to keep upgrading the compact four-door hatch to keep it fresh and alive. It starts with a great base price that will attract new buyers. The all-new Versa Note offers a starting MSRP of just $13,990 US for the 2014 Nissan Versa Note S - which is $680 less than the outgoing Versa Hatch S M/T. The new model comes with Class-exclusive Around View Monitor, new exterior styling that features a new steeply sloped windshield and sculpted body panels and an available Active Grille Shutter that give it more efficient aerodynamics to slip through the air for better fuel economy. The new front-drive 2014 Versa Note gets fuel economy of 40 mpg highway and best-in-class 31 mpg city and 35 mpg combined fuel economy when equipped with the CVT automatic transmission. It also comes with smart packaging and class-leading cargo space with available Divide-N-Hide Adjustable Floor (adjustable rear load floor height). Options include NissanConnect with Navigation System with Hands-Free Text Messaging Assistant, Google Services, Pandora compatibility and Bluetooth Streaming Audio. The new Versa Note is powered by a 1.6-liter DOHC 4-cylinder engine with dual fuel injection and Twin CVTCS (Continuously Variable Timing Control System). The Versa Note S comes mated to a five-speed manual transmission, while the S Plus and SV models are equipped with a standard next-generation Nissan Xtronic CVT automatic. Nissan doesn’t plan on giving up the number one spot easily and isn’t afraid to say so. Fred Diaz, divisional vice president, Nissan Sales & Marketing said, "The all-new Versa Note is aggressively designed, equipped, packaged and priced, serving notice to the competition that Nissan intends to remain the key player in the entry segment for a long time to come." The all-new next-generation 2014 Nissan Versa Note first appeared in Detroit and will likely stay a big hit with its class-leading fuel economy, cutting-edge technologies, new exterior design, roomy and versatile interior and available activity enhancing features that set it apart from the competition. 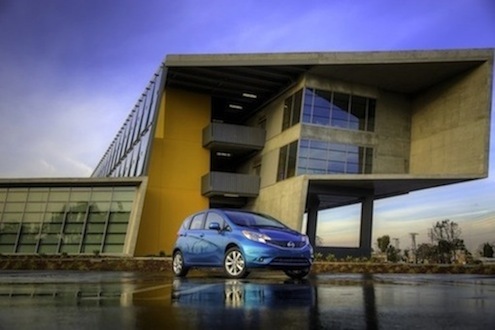 The new Versa Note goes on sale this month at Nissan showrooms across the U.S.
Watch 2014 Nissan Versa Note video.